If you're lucky enough to spend the day surrounded by co-workers whom you consider close friends, count your blessings. Not everyone has the good fortune to work side-by-side with those whom they connect with on the deepest personal level. For most of us, co-worker relationships are pleasant, friendly and warm -- but you're still bound by the rules of professionalism and respectful distance.It's always a good idea -- but not always easy -- to recognize the line between a true friendship and a working friendship. Respecting this line means maintaining control over how much you share and disclose in the office. It also means you allow co-workers to choose their own level of disclosure when they decide to share with you. Warmly congratulate co-workers on their personal milestones. But while you show interest, be careful with your follow-up questions. Don't probe. No matter how friendly your intentions may be, if they aren't welcome, they'll come off as judgmental and nosy. Don't be a "topper," especially not at work. If someone shares the details of a liver surgery or a nephew's car accident, just listen. Show interest with questions that respect the established level of disclosure. If you feel your own story might help her or shed light on their situation, feel free to tell it. But if you're just trying to keep the attention focused on yourself, don't. 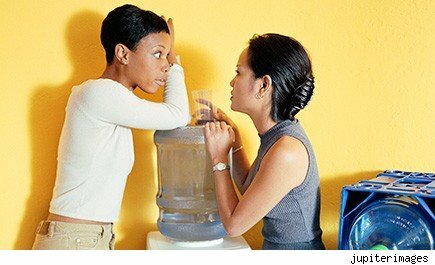 A little gossip in the workplace can provide a pressure release, a way for co-workers to bond and a way for newer employees to feel included. But healthy gossip becomes toxic when it involves criticizing someone for behaviors that 1) don't hurt anyone else, 2) can't be controlled or 3) may be the result of circumstances the gossiping parties don't understand. Snarking about a tyrannical boss is one thing. Snarking about a defenseless, absent co-worker who may be facing unknown personal challenges is quite another. Just as you respect the disclosure levels of others, show the same respect for your own. Don't reveal anything that may invite judgment or open you up to attack. Just because you work here doesn't mean you're obligated to trust everyone around you. Among friends and family, it's wise to open up and let those who love you find ways to help you. But at work, this just isn't the case. In fact, if those around you see your difficulties as a threat to the company and feel forced to choose between one or the other, they're likely to act on behalf of the company, not you. It sounds cruel, but it happens all the time. You can say this a thousand different ways, and all of them are unwelcome in the workplace. At the very heart of being a jerk lies a desire to dominate, upstage or gain power over others. If you're really set on doing this, and the reward (dominance) is worth the risk (losing respect, social capital, allies and friends), then go ahead. But as soon as those around you recognize the game you're playing, it's over. And you've lost. There's a smarter way to gain influence and rally others behind you: Lift them up. Ironically, the more you give praise, share credit, shine the spotlight on others and raise others above yourself, the faster you'll rise. Jenny Treanor is a career adviser and job search expert whose articles appear regularly on www.livecareer.com. Check them out at www.facebook.com/Livecareer or on Google+ for advice and tips on all things career- and resume-related.